Mary Green points out the month’s colours. It’s really autumn now, though we often have a warm spell in early October. This used to be called St Luke’s Little Summer, and it’s surprising how often you can still enjoy sitting out in the sun at this time. It’s also called an Indian summer, a term borrowed from America. Whatever the weather, the leaves are turning and by this time the predominant colours include red and orange on top of September’s gold. There are no more new flowers starting, though the ivy is in full flower as I mentioned last month. However, in a mild year quite a few of the summer flowers are still blooming, so you can still see late bees and butterflies hovering over them. Most of the summer-visiting birds have gone, including swallows, martins and chiffchaffs. Some of the song birds which are resident here also migrate between countries in winter and summer. Most of the birds staying have gone quiet by now. You still hear songs from the robins, woodpigeons and collared doves, and thrushes are known for occasionally starting up out of season. The water-fowl can still be quite noisy too, especially ducks and geese. The drakes have their bright plumage back now, so what birds you see are bright and varied in colour at this time of year. I was interested to see several swans coming to our canal at the end of summer. The resident pair and their remaining cygnets are up at Jacob’s Cut again, but these others must have arrived from somewhere else. They are not a this-year’s family – this year’s cygnets are still in their brown plumage, and these are all fully white. Usually the young leave their parents in mid-winter when they are getting their white plumage. So it’s quite unusual to see a group of adults moving around together like this. I wonder if they’ll settle here. Canada geese are very different. Their goslings, born in May, start to get adult plumage in June and are fully adult-looking in July. I wonder if this is because geese are usually migratory – most of our native geese are, and are only in one place for parts of the year. Canada geese don’t migrate, though I wonder if they originally did before they moved here. Here they stay put most of their lives in one place, though some vestige of the migrant instinct makes them wheel around in great flocks in early autumn. Maybe the rapid maturing of their young is also part of this history. By now the ash trees will probably be bare and the field maples will be yellow. We will already have had a flush of red from the non-native maples in Alvechurch. Many people don’t recognise our native acer, the field maple. It has a small five-pointed hand-shaped leaf. It’s quite common in hedges here and grows to a medium sized tree. In October it turns a beautiful golden colour. Occasionally you can find one that turns reddish-brown instead. There is a red one I can see on the hill-top opposite my house. Another tree that turns a gorgeous red-brown at this time is the wild service tree. These are quite common here in Withybed, and used to be a very common sight throughout the Midlands, but are now quite rare. Their leaves are a complicated shape, a bit like the maples or sycamores but with more points. They have small brown fruits hanging in bunches. These don’t look very prepossessing, but are edible once they are really ripe and soft. They used to be called chequers, and were picked and sold like sweets. The wild cherry has beautiful long red leaves, which often last until October and then carpet the ground. They are common in hedges round here and grow in several churchyards too. But the trees that really make October’s colours are the beech and the oak. Beech leaves turn a beautiful golden-red, and because the trees are an elegant shape they look stunning. There are particularly good ones in Shortwood, along the canal, but they are scattered about everywhere in our villages and old hedge-lines. They have hard brown fruits called mast, not edible as they are but capable of producing an edible oil. This year they have plenty of mast. Beech has smooth bark, and with this and its beautiful shape, leaves which are lime green in spring and red-gold in autumn, has led it to be called the Queen of the Woods. Oak is of course really plentiful around here. Trees grow slowly and start to bear acorns when they are about 20 years old. This year every mature tree round here is really laden with acorns – what’s known as a “mast year”. Oaks do this every few years, in a way that doesn’t seem to relate to any specific weather in the earlier part of the year. Scientists have found that oaks are able to communicate with other oaks, though they aren’t sure how. The trees seem to use the mast year to ensure the continuation of their species. If they all have masses of fruit together, the animals and birds that feed on them won’t be able to eat them all, so many will be successful and grow. Less obviously, the crannies in their bark are home to dozens of different kinds of insect and other small creatures. These in turn are food for other birds, especially woodpeckers, tree-creepers, jays and nuthatches – the birds of the woods. Oak leaves turn brown slowly, some trees going before others. They are not spectacularly glossy like beech, but become a consistent matt brown and hang on for a long time. This means oak trees, especially when free-standing in fields, are strong and beautiful presences throughout October and November. Under the trees, and sometimes on them, October is the time for woodland fungi. They are often later than the open-field ones which come in September. The one which most strongly echoes the colours of the leaves is of course the iconic fly agaric. This is the large red fungus with white spots, highly poisonous. But the brown bolete (also known as the cep or penny-bun) growing in the same habitat is lovely to eat. The strange-looking reddish jelly-ear, which grows on elder trees, is also edible though it doesn’t look very attractive. Of course, you shouldn’t eat fungi without taking expert advice! Fungi are everywhere, though most of their structure is underground. The part we see is the fruiting body which carries the spores – the reproductive part. Fungi feed on all kinds of decaying vegetable matter, including wood, and form part of the intricate habitat of our plant and animal life. Perhaps the most striking colourful element of this month is the berries. Hawthorn berries are really thick and red now, and show up even more as the bushes lose their golden-brown leaves. How long the berries stay there depends on the weather: if it is cold the migratory birds will strip them quite early, if mild they will last till Christmas. From now on, look out for the flocks of redwings – thrush-like birds with a flash of red under their wings. They come in gangs when it is too cold for them up north. Our more common blackbirds and thrushes also feed on hawthorn. The berries have a pleasant taste like tiny apples, and are a good addition to hedgerow jam. 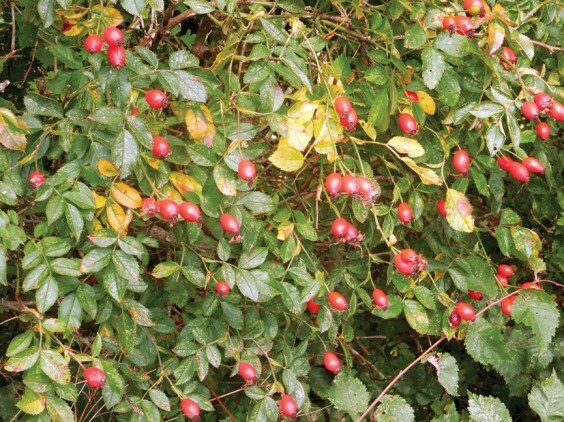 Rose hips (pictured above) are the other prominent red berry, a more orange-red and longer. They are so full of vitamins that they were picked in wartime for rose-hip syrup, and again are good in jam. But with these you need to carefully get rid of the seeds, which are inedible and itchy. Hips and haws are from the same family, the lovely rose family all of which is edible. And at last the sloes, another from this family, from the blackthorn tree, are ready for picking. They should be ripe and soft to the touch, though they will still be bitter. As well as sloe gin, they can make another addition to hedgerow jam. Birds do eat them, though they are often on the trees very late in the year till they really soften. Apples are in this family too. Though the early ones have long ago dropped, the later varieties of orchard apples are just right now. It’s worth remembering that they feed birds, insects and invertebrates as well as us. Other colourful berries and trees include spindle and guelder rose, both of which have pink/red berries and red leaves, and dogwood with red leaves and black berries. Something I can’t catch in the photos is the smell of this time of year. It’s sweet and fruity but also has notes of rotting vegetation and fungus – a lovely rich scent of the movement of life. At the end of October is the fire-festival of Hallowe’en, the day before All Hallows. In Alvechurch this year there is a pumpkin festival around that time. Below is a poem I wrote last year. Everything is shedding to allow new life. Than the ghosts they are created for.